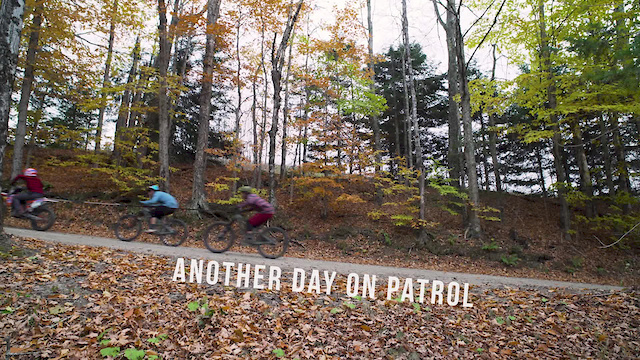 "Another Day on Patrol" isn't a video with a story line, it's about getting out with a buddy, no matter the conditions, and riding bikes. This series started in Retallack, where we were hit with snow, rain and sun all within minutes of each other over the course of filming. Installment #2 comes to you from East Burke VT, where the conditions faired similar, as well as the good times. New England riding is awesome! Up until the end I was thinking that these trails look familiar, then comes the massive wooden booter at the end and it’s Victory! Love the tow in, awesome! This video is fantastic, but it would be even better if it had better music. Another good vid on Patrol! Keep em rolling guys! It's pretty ironical that a company who makes fun of e-bikes actually shuttles behind a motorbike. Come on guys, you can pedal up the hill! Had to watch again, VOD! Another group of idiots that think brake skidding b4 a turn is cool n doesnt hurt trail...lets all go back to proper brake use and not trying to be so cool. yikes dude just because you have no style doesn't mean you should be calling these badasses "idiots" ??? ?